Come drop by Savannah's newest paddling store in 2011. A celebration of life, death and paddling on the third side of the world. The planets were truly aligned for the dynamic paddling duo, Mr & Mrs Law of Savannah Canoe and Kayak, when they headed to India on unofficial kayak business. "We sailed through a barrage of obstacles to get our two man collapsible kayak to the other side of the world". 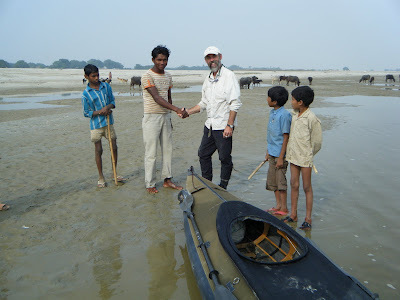 The destination was a 220 mile section on River Ganges where it flows across the Gangetic plane. The river is the most polluted waterway in the world and the section from Kanpur to Varanassi is the most polluted part of the Ganga. It is also the most holy. The couple spent a month in the sub continent. The first week was for cultural acclimation and river scouting in the foothills of the Himalayas. Week two and three was spent on the river, while the last week was for shopping. Of course, the best part was the kayaking. "We were surrounded by death and filth in the most densely populated part of planet earth. It was fascinating and just what we needed". Aside from some very heavy metal pollutants, there is an abundance untreated human sewage and dead bodies. In terms of water quality, this river is as nasty as it gets. "There is no doubt we were very fortunate on the whole trip with not so much as a loose stool or missed connection. It was as if the Lord God Shiva himself layed waste to the foes, demons, and bacterial evil spirits against adventure travellers", said lead guide, Mr Nigel Law. Here are a few slides from the trip. There will be a video, photos and more stories coming soon. We’ve had a major victory to protect our oceans. After years of hard work, I’m happy to announce that the Senate just passed the Shark Conservation Act, which will end shark finning in US waters. Shark fin soup is an expensive dish that drives the shark finning trade, but the role sharks play in marine ecosystems is priceless. By improving shark conservation, the US is improving overall ocean health. Each year, commercial fishing kills more than 100 million sharks worldwide – including tens of millions for just their fins. The requirement to land sharks whole, as well as a new prohibition on the transfer of fins at sea, will help end shark finning by U.S. fishing vessels. The House still has to pass the Shark Conservation Act before it becomes law, but I didn’t want to wait to share this exciting news – your love of the oceans and sharks has helped protect these magnificent creatures for generations to come. Thank you once again and be sure to spread the good news! From Brian Jolly at Halfmoon. 'On the 2nd of December the Jepson Center will be showing a series of short films brought to you by those kids at the Savannah Riverkeepers, Wild & Scenic Environmental Film Festival and Half-Moon. There will be live music from the local artist Stewart Marshall of Junkyard Angels/ Stewart & Winfield at the reception starting at 5:30pm with the movies to follow at 6:30pm (program attached). There will be raffles, drinks, food and a good time waiting thanks to Cha-Bella and MoonRiver. Tickets are $10 and it looks like there will be seating for 200 plus, so I wanted to make sure you knew about this so we can try and sell it out! This is where I need your help. Please pass this on to anyone you might think would be interested. We’ll have tickets on sale at Half-Moon Outfitters and at the Jepson during the reception. I can easily put them on hold if you’re interested for will-call. Thanks Brian, we will pass it on.